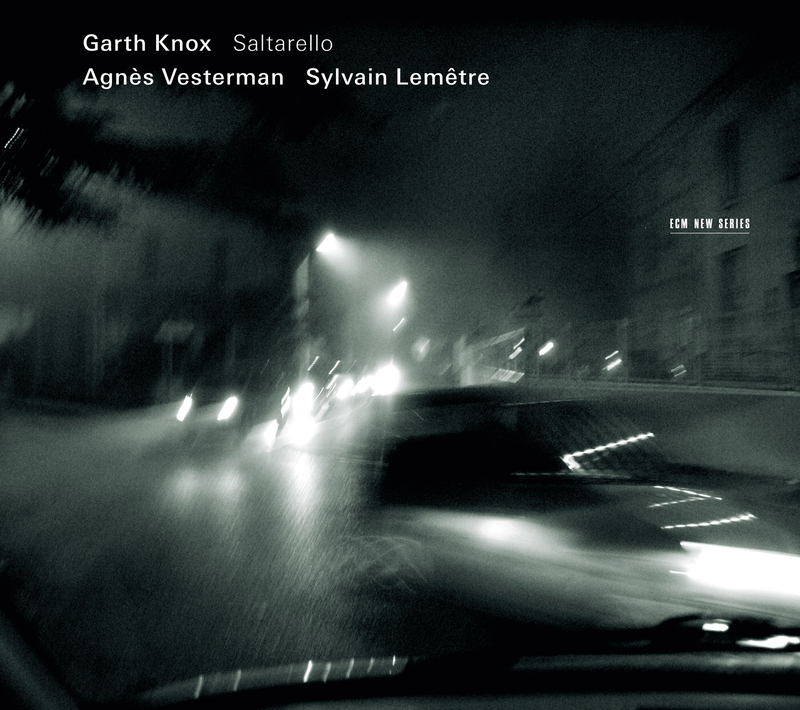 Garth Knox describes Saltarello, his second nominal disc for ECM’s New Series following 2008’s D’Amore, as “a mobile structure of musical ‘snapshots’ taken from nearly one thousand years of music.” As the former violist of the Arditti Quartet, Knox gained in-depth knowledge of music by living composers, all the while strengthening his relationship to the viola d’amore and folk-grounded fiddling, and compresses that knowledge into a roaming program. Knox has also developed his voice as a composer, as demonstrated by his Fuga libre for viola solo, which juxtaposes fiery arpeggios with moonlit pizzicato diffusions, glissandi, and harmonic overlays. This cellular approach is writ large across the album’s full breadth, which for the most part traverses centuries-old lineages. Joining Knox on his time travels are cellist Agnès Vesterman and percussionist Sylvian Lemêtre. On the deepest end of the spectrum we encounter works of medieval masters Hildegard von Bingen and Guillaume de Machaut. The former’s lilting poetry, liturgical and solemn to its ashen core, comes out all the more authentically in the intimate setting, while the latter’s Tels rit au ma[t]in qui au soir pleure adds percussion in Sephardic spirit. Three dances from the 14th century speak further to an ancient aesthetic uncluttered by the discontents of modernity, resonating instead through the viola d’amore’s singing body. Here, too, the percussion balances luminescence opposite Knox’s originary tone. A handful of traditionals takes us into less definable territory, where Appalachian folk song and Irish fiddling meet in Black Brittany in limber arrangement with cello, and a trio of Irish tunes under the title of Pipe, harp and fiddle turns temerity into joy through a prism of bells and drums. A dip into the font of the Baroque gives up the ghosts of Henry Purcell and Antonio Vivaldi. Where one feels steeped in downright cinematic tragedy, the other crucibles a concerto originally written for viola d’amore and orchestra down to its lead and bass lines, so that the striking geometries of each movement, from dancing to slumbering to dancing again, mold a beautiful sculpture of exuberance. Bolstering all of this is contemporary Finnish composer Kaija Saariaho’s Vent nocturne for viola and electronics, which was written especially for Knox. The first of its two movements bears the title “Sombres miroirs” (Dark Mirrors), the second “Soupirs de l’obscur” (Breaths of the Obscure). The piece includes the composer’s own breathing, as well as the amplified sound of the bow drawn across a string, in a mood that best recalls Sofia Gubaidulina’s String Quartet No. 4. It’s a windblown reverie, opened and not merely enhanced by the technological overlay. It is sometimes restless and draws from a relatively stark palette, even as glass harmonica-like drones bleed into frame as if they were time itself. Splitting the two movements even as it binds them is John Dowland’s Flow My Tears, a song last heard under ECM auspices with words on In Darkness Let Me Dwell. It is, like the album as a unit, a prayer that looks itself in the mirror and neither smiles nor frowns, but takes in the entire face, scars and all, as something greater than the sum of its features.